Western Washington Carpenters vote contract down! 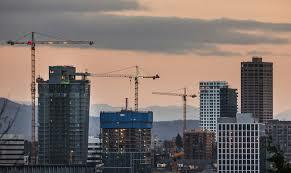 The booming construction business in Seattle. With the boom, carpenters can get and deserve a top dollar contract. If not now, when? Congratulations to carpenters in Western Washington State. About a week ago, they rejected a contract proposal by about 2-1. This came after a “teleconference” in early May in which some 3,000 union members participated. The “teleconference” is kind of like a controlled meeting. The leadership gets to try to sell its bill of goods and can somewhat control who gets to speak. Equally important, by not physically being in the same hall together, the members don’t get to feel their collective power. But according to reports, the mood against the conference was so powerful that even in that teleconference some carpenters called in and spoke against the contract proposal. The original proposal was for a $2.00 increase in wages and $1.00 for a 401K. After that was voted down, the Regional Council leadership came up with a new proposal which basically shuffled a very similar package around. This rejection of this contract comes at a time when teachers all around the country are ignoring their union leadership and going out on strike. It seems to be part of a renewed wave of worker militancy, and in part it’s generated by the low unemployment and the fact that wages and conditions aren’t keeping pace with the cost of living. The Carpenters Union leadership is still stuck in the mode of: Keep the contractors happy and help “our” contractors compete with the non-union contractors. In reality, what that means is that union carpenters have to compete with non-union carpenters for who can work cheapest. But in that case, what’s the purpose of even having a union? It’s nothing but the “race to the bottom”. Instead, the union should mobilize its members to fight to get top dollar from the contractors. If they have to shut down the entire industry, so be it. Then, when the dust settles, those members who fought for that prime, Grade A contract can go and use that contract to get the non-union carpenters to shut down their jobs and win the same contract. The present course isn’t working, as the facts in this article show. It’s not stopping the growth of the non-union and it’s not keeping the union carpenters up with the cost of living. The 1999 SF Bay Area carpenters wildcat strike. Strikers met every day after picketing to decide on our next step. We struck against our own leadership. Actions like these will play a role in transforming the unions. Meanwhile, hats off to the Western Washington carpenters. Carpenters, union members, in fact all workers should be supporting you. For a more in-depth view of what’s happened in the Carpenters Union and in the labor movement overall, see this pamphlet. Update: A new contract proposal which was similar to the last one was also heavily defeated. The present contract is set to expire the end of May. It’s possible that one plan of the leadership is to drag the negotiation process out over months and months. This would mean that during that time the members would get no raise at all. They would also tend to get demoralized by the lack of action. Once that is accomplished, then the leadership would feel in a better shape to push through another inferior contract.